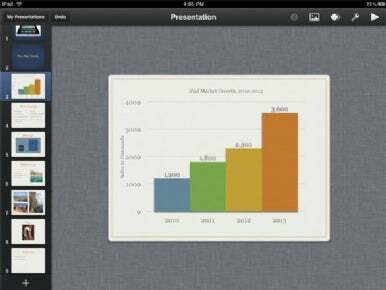 Apple’s iPad-ified iWork apps are generally praised for their polish and functionality. But one place these apps, particularly Keynote, can fall short is when opening a document imported from their desktop counterparts. Specifically, importing a Keynote presentation can often strip critical data out of the document. If you need to wrap up a Keynote presentation on your iPad and maintain things like formatting and images, Apple has a new support document just for you. Keynote for iPad: best practices doesn’t quite delve into industry secrets like how to properly pace your presentation or “for the love of all things holy: stop using Comic Sans.” But it does cover some general rules for ensuring that the Keynote presentation you crafted on your Mac will still look and behave the same way when you continue working on it with your iPad. Apple recommends specific themes, a slide size, fonts common to both platforms, master slide types, and image formats that will not get lost in translation from Mac to iPad. Apple also links this support document that covers how to reduce PDF file sizes with Mac OS X’s Preview app if you absolutely must use PDFs in your presentations. It’s nice to see Apple help iPad users to Keynote better on-the-go, but I wonder if the other iWork apps for iPad could benefit with their own "best practices" docs. I’ve heard of formatting problems when transferring Pages docs from Mac to iPad, and I’m sure Numbers might have some similar issues to account for.